Through groundwork with horses, hands-on energy healing, sound therapy and animal communication, Shelly Burton uses her Samhara Energy Medicine™ system to help horse and human restore balance to the mind, body and spirit; and release traumas that have manifested as physical pain or emotional blockages. Together, they heal and deepen their partnership. Horse Medicine™ helps you align with the GPS of your soul and unlock the critical path to your goals. The above video features notable scientists, athletes and entrepreneurs experiencing Horse Medicine™, including Dr. Mark Hyman, MD and Amy Millar, Olympic Show Jumping Rider. Horses become your reconnect button. The horse’s heart is five times greater in size and beats more slowly than our human heart. 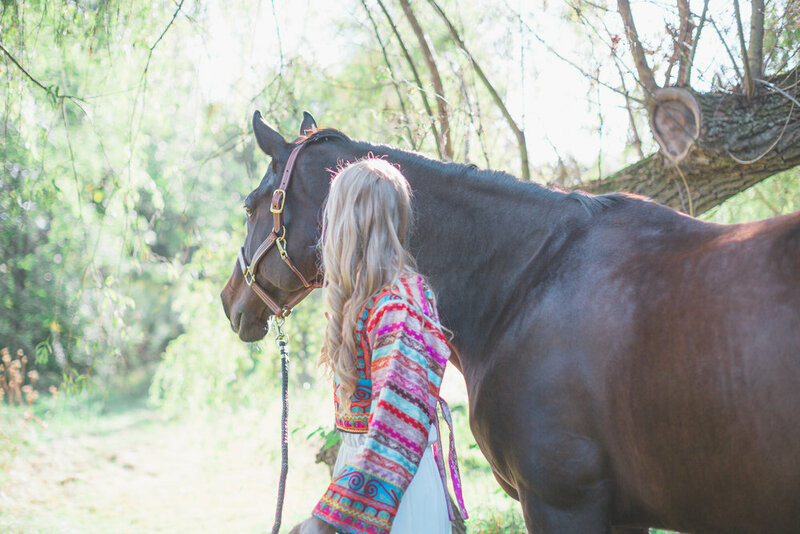 By being around a horse, our heart feels a natural calm. Horses are also prey animals, and they scan the energy of their environment to determine if they are safe. If we are resisting our emotions, or have overactive minds due to stress or fear, the horse reads us as a predator and moves away. Horses give clear unconditional feedback of how we feel, through their behaviour. When you are calm and present, the horse will open to connect with you. Ready to receive horse medicine? Allow an unbridled horse to mirror emotional blockages and heal them through its love, alongside Reiki, channeling and sound therapy. By helping to relieve the stress, loneliness, and frustration of persistent concussion symptoms, horse medicine can help you start to feel better. Shelly Burton holds a Masters in Medical Anthropology from Oxford University and an Honours B.Sc. in Biomedical Science from the University of Guelph. Her Samhara Energy Medicine™ system is recognized by the Canadian Examining Board of Healthcare Practitioners, the Canadian Reiki Association, and the City of Toronto. She is a highly sought after practitioner who has hosted workshops at the prestigious Soho Farmhouse in the UK, and has a cast of worldwide clients from New York to Los Angeles, London to Paris.